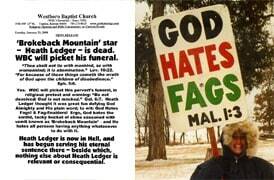 Fred Phelps’ Westboro Baptist Church and his band of haters plan to picket the funeral of actor Heath Ledger, because of his involvement in Brokeback Mountain. The Kansas-based ministry was recently ordered to pay $11 million to the father of a slain U.S. soldier for picketing at the funeral of his son. Westboro Baptist claims that the deaths of U.S. soldiers in Iraq and Afghanistan are God’s wrath against a nation that tolerates homosexuality.